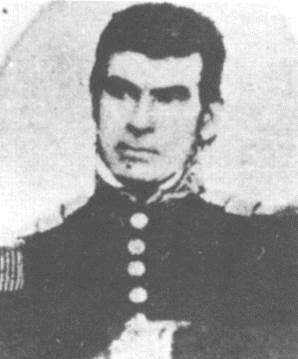 José de Urrea, military officer, was born in 1797 in the presidio of Tucson, Sonora (now Arizona). He was a military cadet in the presidial company of San Rafael Buenavista in 1809 and a lieutenant in 1816, participating in battles in Jalisco and Michoacán. Urrea was separated from army service, but in 1829 he reentered and fought in Tampico with Antonio López de Santa Anna against Isidro Barradas. He intervened in the Plan of Jalapa against the government of Vicente Ramón Guerrero and when Anastasio Bustamante came to power (1829–30), Urrea was named to the secretariat of the command in Durango. He was made a lieutenant colonel in 1831. In July 1832, along with Santa Anna, he declared for Gómez Pedraza, and in 1834 he assumed the command of the permanent regiment of Cuautla, near Cuernavaca, after having received the rank of colonel from Francisco Ellorriaga, whom he had supported. As acting general in July 1835, he was sent to fight the Comanches in Durango, where he was commandant general and then governor in September and October. He participated in the expedition to Texas in 1836 and was engaged in the battles at San Patricio, Agua Dulce Creek, and Coleto. He was ordered by Santa Anna to execute the men taken prisoner in the Battle Coleto under Colonel James Fannin on March 21. Urrea was opposed to the withdrawal of Mexican troops ordered by the captive Santa Anna after the battle of San Jacinto.